"Traditional" K'NEX can be used by children aged 3 to 5, with supervision, but some children of this age may find that their fingers are not strong enough to join K'NEX rods to connectors. The manufacturers of K'NEX recognised this problem, and in 2003 brought out the Kid K'NEX range. 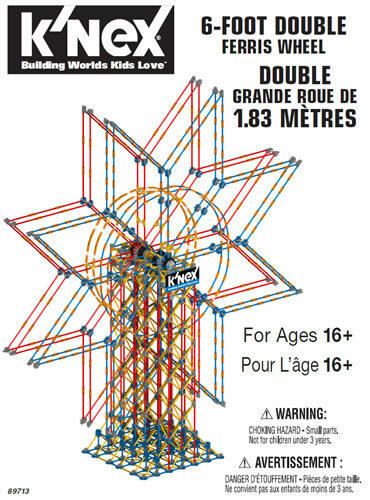 Kid K'NEX is suitable for ages 3 to 7, so there is some age overlap with traditional K'NEX. Kid K'NEX is a version of K'NEX with larger, chunkier rods and connectors that small hands can more easily join together. 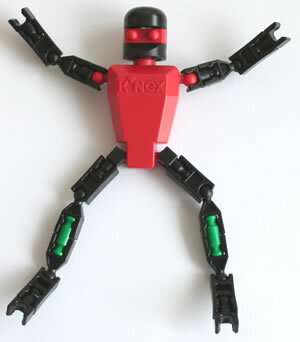 The bright, almost fluorescent colours appeal to young children, but undoubtedly the most attractive feature of Kid K'NEX are the eyes, ears and feet, as the photo shows. 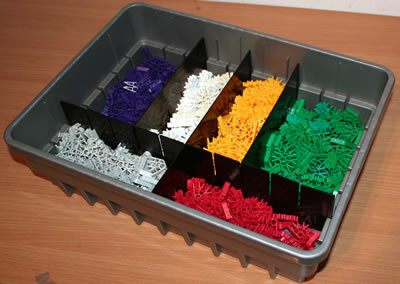 Kid K'NEX characters can also be used to link into other activities that the age group enjoy, such as story telling. 1. Build a house for the Kid K'NEX creatures you have built. 2. Make a table and chair for the Kid K'NEX creatures to use. 3. Make a Kid K'NEX garden. 4. Make a Kid K'NEX bus (if you have the Kid K'NEX Transportation set). Our K'NEX shop includes all the Kid K'NEX education sets that are available.